Graduate aptitude test in engineering (GATE) is conducted every year by Indian Institute of Science, Bangalore and seven Indian Institutes of Technology (IIT). Graduate aptitude test in engineering (GATE) Examination is mainly for those who want to join Indian Institute of Science, Bangalore or any Indian Institutes of Technology (IIT) out of seven IITs or any reputed college for higher education such as Master in Technology (M. Tech.) or Doctor of Philosophy (Ph. D.). Now GATE 2020 aspirants can download GATE information brochure for GATE 2020 examination using below link. 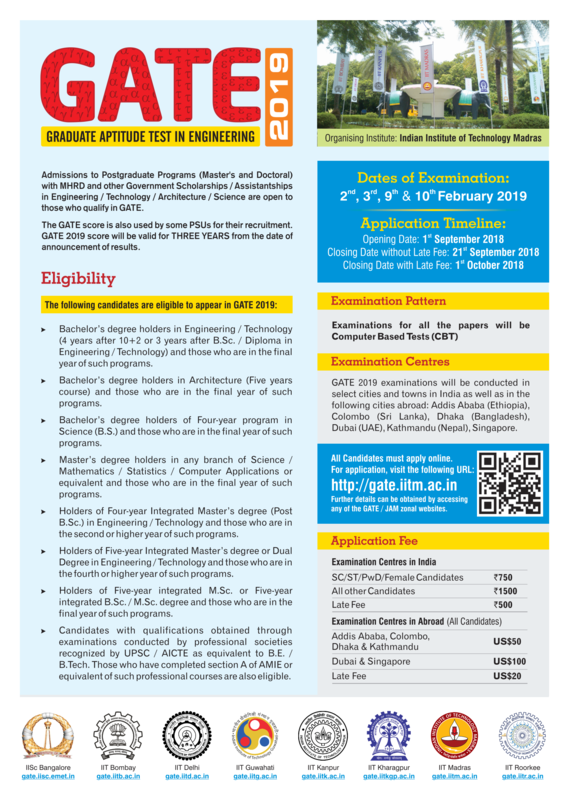 GATE application form would be available from the first week of September, Till than GATE 2020 aspirants for getting all the information please refer GATE 2019 notification. You can consider GATE 2019 notification as a guide and refer it for any kind of doubt related to GATE 2020 examination. Below table contain GATE 2014, 2015, 2016, 2017, 2018 & GATE 2019 Brochure in free PDF format. Here we have provided all GATE 2014, 2015, 2016, 2017, 2018 & GATE 2019 Brochure so that aspirants can compare GATE 2014, 2015, 2016, 2017, 2018 & GATE 2019 information. Because GATE office has changed lots of things in GATE 2019 in respect of GATE 2018. 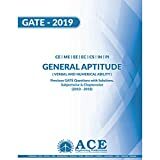 GATE 2020 aspirants can download these GATE 2014, 2015, 2016, 2017, 2018 & GATE 2019 Brochure from the link given below. Hello, I am Padam Prasad Paudel from Institute of Engineering Tribhuvan University Nepal. I got a problem after filling the form and while submitting and proceeding for payment. Application Submission failed! Please try submitting it again! Carefully go through the Eligibility Criteria for GATE 2019 prior to filling up the application form. Ensure that you meet the eligibility criteria and have the necessary certificates/documents as required. Even all of my submissions are correct and according to the Eligibility Criteria for GATE 2019. Please, kindly review it and what was going on wrong, reply me and help. If you have filled all the necessary details correctly then it must be GATE 2019 Officer Server Error. Try Submitting GATE 2019 Application Form Late Night or Early Morning. Hello, I am from Nepal, I want to join master program in Agricultural Engineering IIT Kharakpur. I am just completed my bachelor degree in Agricultural Engineering from Institute of Engineering TU Nepal. What are the criteria for getting a scholarship for my case? Here we are providing some informative link for your query related to IIT Scholarship for M Tech Students. meine m.sc microbiology & immunology se ki hai kya mein gate ka form biotechnology se fill kr skti hu ya fr lifescience se hi fill krna padega please give response asap. sir /madam, your site is really very very helpful for the preparation of gate examaination and ies..i want to know that is postal material of standard institution such as made easy and ace academy is sufficient for gate preparation? will i crack the gate using those material?or i must join coaching? i am confused.pls guide me……..
It’s totally depends upon you preparing GATE either with the help of coaching institute or without help of coaching institute. Let me tell you some facts only 15-16% candidates of total appeared are able to clear GATE every year. May be many of them joined coaching and don’t even able to clear GATE or may be some would be there who don’t even know the name of coaching institutes and get good rank in GATE. So you success in GATE doesn’t depend upon either you take coaching or not it depends upon how well you prepare for GATE. Dear Sir, I have completed B.Tech in Electronics And Communication Engineering from Delhi Technological University.Now I want to pursue M.tech in Computer Science in IIT Delhi.Is it possible? There are some seats in each branch reserved for other branch GATE qualifiers (only of related branch). Dear Sir,I have completed B.Tech in Electronics And Communication in 2016.Now I want to pursue M.Tech in Computer Science in IIT Delhi…Is it possible? my name is ghouse and i am belongs BC-E category (muslim minority). so under which category should i apply.. General or OBC? Caste n community changes state wise. So you have to find yourself in which category or caste you belong. Otherwise fill form from General category. how many times can i apply for gate . As many time you wish. There is no age limit in GATE exam. My son is in Aeronautical Engineering (3rd year). He is interested to take GATE Exam. What is the GATE marks required for IIT’s / IISc / DIAT-PUNE / IIST-TVM / MIT-CHENNAI. It is possible to guide me, which are the best GATE coaching centres in Chennai for Aeronautical ? We will soon update list of previous years rank analysis for all GATE papers required for IIT’s n other good colleges. You have to wait few days for that. Currently we are busy in helping candidates in their GATE 2016 application form filling. After that we will totally emphasis on providing guidance for GATE 2016 preparation n all. At present we have no info about good coaching center for Aeronautical engineering in Chennai. Wherever we will have information related to such institute we will notify on this blog very soon. You please keep vising this blog for getting information related to GATE 2016. Sir i am doing MSC chemistry from an IIT, my institute follows CPI system and do not have any conversion system into percentage. For applying in PSU’S like ONGC they ask for converting CPI score into percentage. I am having a CPI of 8.5 but do not have any conversion factor. Does psu’s provide any conversion factor for these type of cases as they are very frequent for an iit student! plz help me and suggest me something. There is always a conversion system which an institute used. Please ask to your administration about it. I am in Btech 4th year of karnataka state open university , am I eligible for gate16. Is your course which you are doing AICTE approved ? i have less den 60% in btech….nd im appearing in gate 2016..
can u kindly suggest me some gud govt colleges…if i clear gate 2016, for pursuing mtech. my stream is mechanical engg. First preference must be IISc/IITs then NITs/IIITs then state engineering colleges of your state. You can easily find ranking list of your state engineering colleges on internet. I have completed my B.E., under MECHANICAL ENGG (2012 Passed out), later I have completed my master degree (cross degree – metallurgy). shall write the GATE exam in Metallurgy Dept instead of Mechanical? is there any possibilities? (in my master degree certificate it is mentioned as under the faculty of mechanical Engg). You can write GATE exam in any either Mechanical or Metallurgy. Its your choice. But if you are attending GATE for PSUs then choose Mechanical instead of Metallurgy. Because vacancies for Mechanical is far more than Metallurgy in PSUs. You can easily know this by downloading GATE 2016 syllabus for civil engineering. I completed M.Sc. in GeoInformatics. There is a M.Tech programme in IITB ( GeoInformatics and Natural Resources Engineering). What paper in GATE i should write to join this course. Download information brochure of IITB for Master course or check their official website for eligibility of particular course. You will get your answer. I am 2014 passout (ME).my academic record is superb but have attempted gate two times but in both I can’t even clear cut off. although I joined made easy but the result was same. I don’t know what to do and how to prepare for gate and a bit scared as this year IISC is conducting gate. please kindly guide me. so that I can clear gate exam with a very good marks. Clearing GATE exam is not so hard. There are three section in GATE exam. If you prepare just basics of these all three sections you will get qualified. Remember always cover all these three sections. No section should be left. Sometimes we left a section for preparation and find very easy questions in exam from that section. First find your mistakes in previous attempts. If you find them exactly and resolve them just by resolving them you will qualified GATE this year. (1) make plan as per time availability in a day for study exclude other times like daily routine work etc. First follow easy. Like you are going to study a chapter. Note down all the important topic from exam point of view and study introductory of every topic then move to next chapter and so on. It will not take much time and you will complete your whole syllabus at least once then medium than hard. Make a time table for a whole day, for a week, for a month and for a year for GATE 2016. Stick to the time table. Must include time for revision in each time table. sir, if we pass gate exam in first attempt and couldnt get into any of the IITs ,then are we eligible to write it again??? There is no limit in number of attempt in GATE. In which percentile I get iisc Bangalore or IIT Kanpur.. I completed my B.E. IN CHEMICAL ENGINEERING this year. I applied for gate 2015 also, but unfortunately I could not crack it. So can I apply it again in 2016? whether any changes in syllabus ? Yes you can apply for GATE as many time as you wish. There is no any age limit. There are some minor changes in some subjects syllabus. I want to know that the GATE question paper for M.E admissions and for ONGC reccruitment are same or they are different. Can you please upload the changes of latest ECE Syllabus for GATE subjectwise. We have uploaded new syllabus for GATE 2016. You can easily compare GATE 2015 syllabus and GATE 2016 syllabus, Just download GATE 2015 information brochure. i have to complete my btech in 2015 but due to many backlogs &detains i may complete in 2017.iam i eligible for gate exam if i have year gaps in my btech . Hello sir…..Just now I have finished 2nd year of Engineering(Computer science) and stepping into 3rd year(5th sem)……Am i eligible for 2016 GATE…? ?……I will be Graduating in the year 2017……. To apply for RRBs, Electronics and Instrumentation Engineering will be a degree in combination or substream of Main stream of ? 2. Instrumentation and Control Enginerring. Degree in combination or substream of Electronics Engineering. Sir, any news on incorporation of Petroleum Engg. in GATE 2016?? As per GATE 2016 syllabus related latest official news Petroleum Engineering haven’t added this year. This time GATE office added Petroleum engineering separately in GATE subject list for GATE 2016 examination. How many times a pupil can take gate exam…? When will the gate-2016 brochure will release…? Hello admin, I have cleared GATE 2015 exam in mechanical engineering and I got 45 marks but couldn’t get admission in colleges I wanted. so can I give GATE 2016 even if I have already cleared GATE once? You can apply for GATE if you have passed a 4 year course of engineering. If your degree says, its of 4 year then you are eligible. For more details download GATE 2015 brochure. As per the your reply to one of the question, score card is valid for 3 years. I had qualified gate in the yr 2013..I would like to know is that score card can be applicable for 2016..I did not use the same due to some reason. GATE 2015 score card is valid for 3 years while 2013 was for 2 years. Increase in number of seats in any institute depends upon Institutes administration only. Right now i am in 3rd year.If i give GATE 2016 then for how many years the result of GATE will be valid for applying somewhere? GATE score is valid for 3 years now. Information as per GATE 2015 brochure. What is set 1 and set 2 in 2015? is it online and offline papers? GATE paper in 2015 was online. Different sets represent different day and time format of exam. Electrical engineering would be best for Power engineering candidate. I have done B.Tech in Marine Engineering & I have passed out in Decemberv 2014. Can I apply for GATE 2016…???? 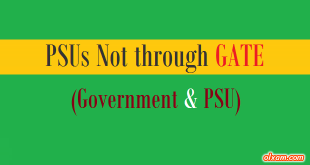 i want to know after filling online application form for gate 2016,and i want to fill online application for psu’s using gate registration number.so i want to know how many psu’s online application form i can fill?means what is the maximum number of psu’s i can fill?pls guide me sir………..
We have prepared a page for PSUs through GATE 2016 where we will put all the information related to application form, form filling dates etc related to all PSUs though GATE2016. You please check this page regularly. In which speclization course offers to the student of B-Tech industrial engnieering..?? Are they elligible for any mechanical speclization courses..? Yes you are eligible for any mechanical specialization courses. 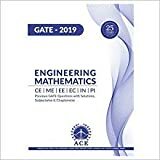 I am in final year of my engineering in Electronics and telecommunication , Can I write GATE 2016 in Computer Science ? Do the IIT/IISC accept Electronics student in there Computer Science program ? Yes you can write GATE 2016 paper in Computer Science. (1) Some institutes will not allow you to enter in their M Tech program bcz they want a candidate must be graduate in Computer science. (2) You can write GATE 2016 paper in Electronics and communication but again you will face some problem like you are now too eligible for M Tech in Computer Science but only for few branches in which an Electronics communication candidate can take admission. I am studying 3rd year mechanical Engg. Can I write the Gate 2016 Exam? I Need to know the Notification of GATE 2016. Wait till 1st week of September, 2015. Very useful information on this site. Thanks gate 2016 team. GATE is nowadays useful for getting admission for higher education like M Tech or P HD and also it is useful for getting interview call from various PSUs. can mechanical sandwich student apply? If you could more explain this mechanical sandwich to me, I can better help you. even with 1 backlog can we write the gate 2016 ? Yes you can write but you have to fill false information and if you don’t have minimum qualification within the restricted time period then your GATE score will be of no use. It would be like a trial exam. but what is this false information? and when will be the time period to update the cleared subject? Eligibility Criteria for GATE 2015 is : Currently in the 4th year or already completed. So if you acquire this qualification before filling GATE form you are filling GATE form with true information if not than its false information just to attend GATE exam. can I do M.Tech. from IIT in chemical engineering? I have a M.Sc. degree in chemistry. what paper should I write, CY or CH? If you want to do M Tech in chemical engineering then choose CH. If you want to do M Tech in chemistry then choose CY. i had completed mtech in the year 2012 and there a break occured..Now looking for phd.i want to know whether i am eligible for gate 2016. Yes you are eligible for P HD. There is no age limit in GATE and there is no attempt limit in GATE. Sir your work is very good and sir plz tell me that will something change in gate 2016 pattern. There is very less or we can say no chance of changing GATE syllabus and gate exam patter. If it happen then GATE office need to notify it atleast 6 month before the exam bcz anything new can not be prepare in just 3-4 months. So prepare on the basis of GATE 2015 pattern if it change GATE office will notify soon. There is no age limit in GATE exam. Sem back wale student kb apply kr skte he? You can apply for GATE if you are in final year now but you have to have final result in your hand while taking admission in any institute. is it IISC the one organizing gate-2016? can you give the list of the years that IISC took up previously!!! plz!! Most probably yes IISc will organize GATE 2016. Which is the best book for solved previous papers ? Should previous papers be solved chapterwise or year wise? chapter wise would be more fruitful then year wise bcz we study chapter wise. Thanks Shivali for appreciating our work. I am in 1st year of masters of architecture. I gave GATE last year but couldn’t clear.Will i get scholarship in 2nd if i clear GATE next year? Scholarship would be given to only those candidates who clear GATE and then on that GATE score card get admission in any of the nationalize institute. This scholarship will directly provided by MHRD when you get admission through your GATE score card in any institute. So if you clear GATE this year and want to get scholarship then you have to get admission again in any nationalize institute and start your course again from first year. I’m pursuing B.Tech Mechatronics Engineering , i would like to know which subject should i prepare if i want to take up M.Tech Mechatronics. As there is no separate paper for Mechatronics in GATE so you need to choose a subject which is close to your subject. I think Mechanical engineering would be better to choose. then after qualifying GATE, as per your GATE score you can apply for Mechatronics. For more details like qualification, percentage etc visit the institutes website in which you want to get admission. Is there any eligibility criteria for PSU other than GATE like cgpa or cpi ?? I have already given gate 3 times, not qualified, am I eligible to take exam of gate 2016? also my date of birth is 1989, please inform me, whether I am eligible or not? I have heard that petroleum engg will be surely added to GATE – 2016. Is that true? This thing is creating a great confusion. Please help me on this. Sorry we have no such info related to adding petroleum engineering in GATE 20016. Only GATE 2016 Organizing institute can tell you about this so wait for GATE 2016 notification. 1. Candidates who are currently in the 4th/final year or already completed are only eligible for GATE exam. As you said you have completed your MSc IT course so you are eligible to fill GATE form.